I have never been much of a bread maker. It’s not really an area of baking I have explored much. This year however, I for some reason decided that I wanted to make hot cross buns. For my first attempt I used a recipe in Nigella Lawson’s book ‘Feast’. The flavour was nice but the texture wasn’t right. I now know I didn’t knead the dough long enough which was why my hot cross buns were more like hot cross scones. The recipe I have used here is from a recent edition of ‘Gourmet Traveller’ Magazine. The original recipe calls for the use of dried sour cherries, instead of mixed fruit. I think, if you happen to find dried sour cherries in a deli, they would be great. However, if like me, you didn't want to go searching for just one ingredient, just use mixed dried fruit. When I mentioned to someone that I had made these, they suggested using dried cranberries as a substitute. When you think about it, you can just use whatever you have around or whatever you prefer. Just keep it to the same quantities. I have named these ‘rustic’ hot cross buns because, the way they have turned out, they are a bit uneven and well, rustic and homemade looking! They do however, taste great. With more practice I’m sure they will turn out looking better and better each time. Despite the fact I haven’t 100 percent perfected this recipe, I thought it was best to post an Easter related recipe, well, before Easter. Then if you’re game, you can have a go too! 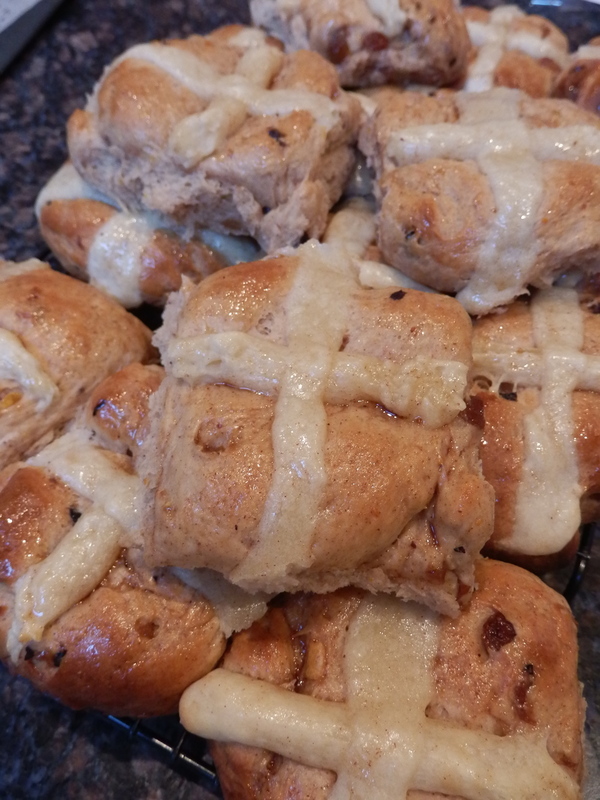 So if you have a chance over the upcoming long weekend, have a go and make some hot cross buns! I promise it’s not as hard as it seems. Using an electric mixer with the dough hook attachment, mix the dried fruit, sugar, yeast, spices, rinds and 770 g of the plain flour. Heat the milk and butter in a saucepan over low heat until the butter melts. Allow to cool slightly and lightly beat in the egg. Then whisk the egg into the butter and the milk. Add the milk mixture to the dry ingredients and knead for 8 to 10 minutes, using a electric mixer with the dough hook attachment on a medium speed. Knead until the dough is soft, elastic and smooth. It is a good idea to do the last couple of minutes of kneading by hand to gauge the texture of the dough. Lightly butter a large bowl, and place the dough inside. Leave covered in a warm place for 50 minutes to one hour, until the dough has doubled in size. I found turning the oven on to 100 degrees Celsius, allowing it to reach the temperature then turning the oven off worked well. Pre-heat the oven whilst you are kneading then, place a heat/oven bowl with the dough into the oven with the door propped open for the proving process. After the dough has doubled in size, push the dough back with your fist to knock the air out of it. Divide the dough in to eighteen to twenty equal pieces. Roll into balls and place on a lined baking tray 1 cm apart, either in a circular pattern or in rows. Cover with a tea towel and allow to prove again for thirty to forty minutes, until doubled in size. Preheat the oven to 220 degrees Celsius. Combine the left over flour, the sunflower oil and cold water in a bowl until it becomes a smooth paste. If the mixture is too runny the crosses will be difficult to pipe. Spoon into a piping bag, or a plastic zip lock bag (and cut a small hole in the corner), and pipe a cross across each bun. Bake for ten minutes, then reduce the oven to 200 degrees Celsius and bake for a further eight to ten minutes. The buns will be ready when they are golden in colour and make a hollow sound when tapped. Allow the buns to cool slightly, then stir the remaining sugar, spice and water into a saucepan on medium heat. Let the sugar dissolve, then allow the mixture to come to a simmer. Remove from heat and allow to cool. Brush the glaze over the buns. Hot Cross Buns are best eaten on the day of baking, however they freeze well. Original recipe can be found in Australian Gourmet Traveller Magazine, April 2014, page 194. Originally Posted April 15, 2014.